Graffiti (singular: graffito; the plural is used as a mass noun) is the name for images or lettering scratched, scrawled, painted or marked in any manner on property. So says Wikipedia. While the definition of graffiti may be quite simple, this word of Italian origin covers many art forms and a wide range of media. Simply said, it's a form of visual art. The earliest form of modern wall graffiti (excluding cave writings and hieroglyphs) appeared in Roman times. Disappointed lovers and disgruntled legionaries used knives and stones to carve messages, usually songs, onto walls. 20th century graffiti is considered to have first appeared in Europe during World War 2 as passing allied soldiers carved things like “Harvey was here” into walls of liberated cities using their bayonets. Graffiti is usually associated with teenagers in the typical 20th century urban populace. Train and bus stations, airports, abandoned parking lots, garages, and even police stations are the typical public places which hooded teenagers armed with spray paint canisters usually haunt. Using spray paint on a wall to draw graffiti is a punishable offence in the USA and most of Western Europe. So why do these teenagers still do it? Graffiti on a wall sends a message. It is an expression of the artist's feelings and thoughts. Done on a public wall, it is art for art's sake. It cannot be owned, bought or hung on one's living room wall at will. It is an expression of freedom, of the artist from society, of art from money. Or if all else fails, it is a tool for marking territory, usually by gangs. Let's go into the unpleasant side of wall graffiti later. For now, let's talk about the incredible colours, the smooth transitions between two different shades, which can only be done by a master artist. Any slightly experienced artist can use a brush on canvas to put up a decent painting. It takes true skill in controlling hand movements when using a spray paint can on a dry crumbly surface. Great graffiti artists would make great puppeteers and watch makers. Creativity wise these people are at the top of the game, pulling out incredible shapes and textures out of their heads like magicians and hats. It takes a lot of practice to develop a sense of what looks good, font wise. Some people have it naturally while others have to experiment and practice on paper before they develop their own style. All artists will do it in their own styles, but there are a few core universal fonts-fat letters, swoopy, tribal style, flowing, jagged, and so on. The writing aside, the actual art is usually dark and gritty images, illustrating the suffering and hardship that usually exists in dense urban areas. Art is supposed to evoke strong feelings on a subject within the viewer. That is the sole purpose of graffiti art (not tagging, mind you-the 9MM and DB10 tags on Dhanmondi walls don't apply here). It's not all serious either. In many cases wall art is fun and cartoonish designed to put a smile on your face. That incredible mix of flowing fonts, meaningful art and vibrant colours and shades is what is so attractive about graffiti. The hub of graffiti artists in Bangladesh is the Dhaka University campus. It's almost impossible to find an empty stretch of wall here. It's not really the artsy type either (other than the walls in TSC and beside Charukola Institute). But it is true to the reason behind graffiti: protesting something. Using the walls as a loudspeaker, students demand the release of some “bhai” who has been locked up for god knows what; lowering of student fees; stopping human rights violations: it is a way for them to speak out against social injustice. At least what they think is injustice. That's the thing about graffiti: it represents real emotions experienced by the artist and holds it up to society. 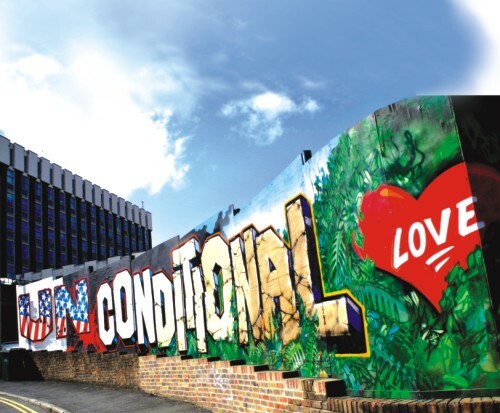 Like most things centred on teenagers like car modifying and general “b-boy” culture, graffiti art is also looked down upon by the “respectable” quarters of society. Like the car-modifying scene is tainted by a few underage kids street racing, similarly, the wall art scene is labelled as hooliganism just because some kids use public walls to mark their gang territories (called tagging). The mistakes of a few affect many. Now any teenager with a spray can in his hand is looked upon suspicious by people on the street, even though he or she might be using it to just to paint his bike a new colour. No matter how much graffiti is looked down upon in society, one thing is clear-it's here to stay. Newer generations will be as fascinated as we are about this corner of street culture, and as long as there are walls in urban cities; people will find a way to leave their mark.